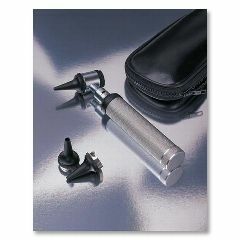 The ACD Otoscope is an affordable Otoscope that offers high quality optics and workmanship. The chrome-plated, brass instrument with knurled grip and satin finish give this otoscope a professional yet elegant look and feel. The ACD Otoscope also comes standard with a bayonet-mounted, locking otoscope head. 4X magnifying lens slides away for instrumentation. Compact instrument is just 7½" long and weighs 7 oz. Includes leatherette carrying case & 3 reusable specula (2.5, 2.5 and 4.5 mm). Uses 2 C batteries (not included). Lightweight. Sturdy. Easy Storage. Safe. Used on my 2 year old who gets frequent ear infections. Easy Storage. Easy To Use. could be a clearer view. This otoscope would not really cut it for professional use. However, if you are just using it at home to examine your family it is adequate. I would not suggest it for the beginner user because I think you need to know what you are looking at and for and this device does not allow as clear visualization as higher quality otoscopes. Lightweight. Sturdy. Easy Storage. Safe. Easy To Use. Clear Instructions. Used by private duty nurse to check for ear problems. She feels it works well esp. for home use. Thank-you for your great customer service. Customer service is a tough job, I used to be a regional service manager for a manufacturing company so I know what I am talking about. You are a real asset to your company, keep up the effort as it is appreciated.